Coming to theaters in 2005! Coming soon from Michael Moore - the man who put "facts" in the "documentary" genre. 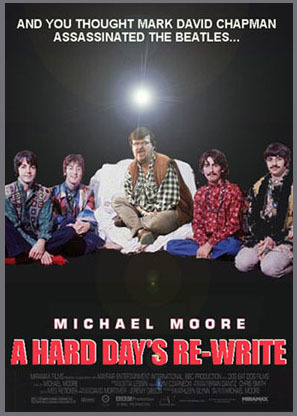 Through the careful and often misleading editing - which he learned from Leni Riefenstahl's "Triumph of the Will" - Michael Moore now takes on the legend of the Beatles. Learn the "true" story of the Beatles as only Michael Moore can tell it. See this film and you will understand why Moore has won more Joseph Goebbels Film Awards than any other documentary film maker to date!